Activision announced today that a video game is in development based on 20th Century Foxâ€™s X-Men 3. X-Men: The Official Movie Game (working title) will be available in stores this May for the Xbox and Xbox 360 video game system from Microsoft, the PlayStation 2 computer entertainment system, the Nintendo GameCube, Nintendo DS, Game Boy Advance and PC. Co-written by Zak Penn, the screenwriter of movies X2: X-Men United and X-Men: The Last Stand, and legendary comic book writer Chris Claremont, X-Men: The Official Movie Game (working title) immerses players in an original storyline that provides the back-story for the upcoming X-Men: The Last Stand feature film. 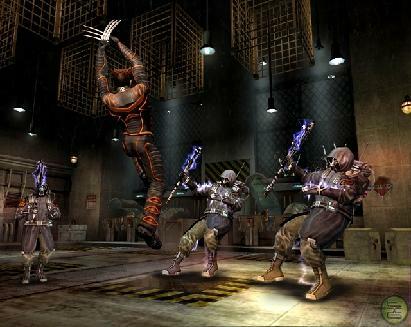 For the first time ever, the game enables players to truly command the powers of popular characters from the X-Men movie universe by allowing players to assume the roles of Wolverine, Nightcrawler, and Iceman as they wield and upgrade their signature powers and maneuver through unique environments designed to showcase their Super Hero abilities. Assisted by other X-Men characters, players will use an advanced control scheme to master and control the characters like never before as they unleash Wolverineâ€™s combat rage, experience Nightcrawlerâ€™s acrobatics and teleportation powers, and glide through the air on Icemanâ€™s ice slide. * Become three legendary heroes â€” Players will immerse themselves in the signature powers of their favorite X-Men heroes -- hack and slash with Wolverineâ€™s brute strength to decimate foes; as Nightcrawler, players will scale walls, spin and BAMF through environments to stay one step ahead of enemies; and experience incredible speed on Icemanâ€™s ice slide while shooting ice beams and creating hailstorms to freeze the opposition. For even more power, players can utilize fury and adrenaline modes to launch devastating attacks. * Experience events leading up to the X-Men: The Last Stand feature film and play beyond â€“ Players will experience epic Super Hero action as the game explains Nightcrawlerâ€™s mysterious absence from the movie, and in-game events foreshadow the roles of the X-Men and Brotherhood in the film. The gameâ€™s climactic ending sets the stage for the movie with intersecting characters and storylines intersecting. * Become a part of the X-Men movie universe â€” Embark on a globe-spanning conflict that delivers every element of the X-men universeâ€”from costumes and enemies to the voice of Patrick Stewart. Explore Alkali Lake, the Statue of Liberty, Dark Cerebro and more. * Battle fierce enemies, join forces with X-Men comrades â€” Face off against villains from both the movie and beyond as favorite X-Men allies join forces with the player in gameplay that includes melee fighting, stealth-style action and time-based missions. * Experience gameplay environments specifically designed to showcase each characterâ€™s Super Hero abilities â€“ Uniquely engineered environments empower players to use different gameplay strategies as they harness their Super Hero powers and defeat enemies. Players will have ultimate control over their heroes as they improve their superpowers over time through the Mutant Evolution System. * Game console features and exclusives â€“ Experience the X-Men universe in amazing HD on the Xbox 360 version of the game. The Game BoyÂ® Advance and the Nintendo DSâ„¢ versions also offer exclusive X-Men characters to play, and for the first time, use the Nintendo DS touch screen to control the X-Men. The FIFA World Cup is the worldâ€™s largest, most-watched sports event. The passion, drama, and character of the tournament, coupled with the exclusive 2002 Fifa World Cup license, are the basis of th..